This year’s Priddy is a promising feast of dance as our regular Dance Festival bursts all over the site. 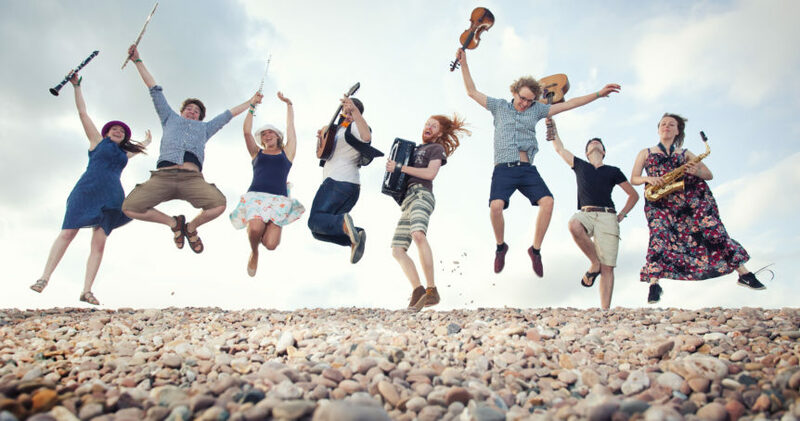 Headlining the dance festival this year are ceilidh band Threepenny Bit, an exciting band of young musicians from Southampton who take traditional dance tunes and contemporary sounds and blend them into a fresh interpretation of folk music. This dynamic eight-piece band (above) combines a group of diehard folkies with some of the finest young jazz and classical musicians in the south. They play bold arrangements of traditional and original tunes with infectious stage energy for concerts and ceilidh dancing. The band’s diverse influences enable them to explore traditional music without restraint, and with their line-up of saxophone, clarinet, bass guitar and drums, alongside accordion, flute, violin and guitar, Threepenny Bit create an unparalleled wall of sound. And there’s more! Also on Saturday we have the return of The Brewery Band and Vicky Cooper and a chance to give Irish Set Dancing a try in a workshop with Val Knight – a good friend of Priddy – and The Perfect Cure. There’s plenty of Morris and other traditional dance in store in store too. We have Fool’s Gambit – a young energetic Morris side drawn from all over the country, dynamic clog duo Fire Clog and a return of NYFTE, the National Youth Folklore Troupe of England, who were such a massive hit at Priddy last year. Also lined up for this year’s Dance Festival are Bristol based Cotswold morris side Nonesuch Morris and Kemysk – Cornish dancers, all fishnets and frolics, making a welcome return visit. We are also delighted to welcome Bristol’s Rag Morris – who will be performing their acclaimed mummers play The Nine Lives Of Isambard Kingdom Brunel, which they wrote and first performed in 2009. And also we welcome the return of the ever-popular Appalachian dancers Applejacks capping off what is promising to be a memorable festival of dance.